Teams of programmers and engineers at Google have created a custom Android app, different versions of which have been named “Maotai” and “Longfei.” The app has already been demonstrated to the Chinese government; the finalized version could be launched in the next six to nine months, pending approval from Chinese officials." Google has a long history of transferring technology to their Chinese authoritarian partners. The Intercept account continues. The obvious dreaded concern is that some deleterious version of Dragonfly will be imposed upon domestic users of Google and Android. So it is significant when VP Mike Pence slams Google over Chinese search engine project and reflects similar concerns with the internal conflict going on within Google. "While Google CEO Sundar Pichai has reportedly said Dragonfly is still in its early stages, it has caused internal problems for the company. The Intercept reports that at least five employees have quit in protest, and 1400 workers have signed a letter demanding more information. 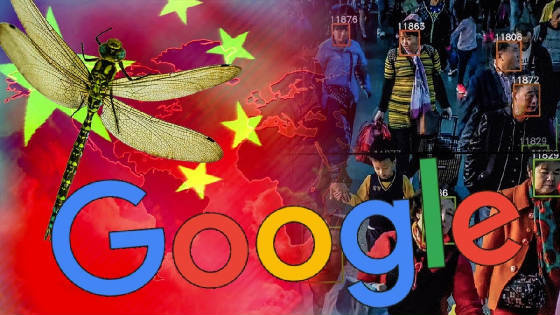 As if blocking social media sites, western news sources, and certain search terms weren’t bad enough, it's been reported that a Dragonfly prototype linked users’ searches to their personal phone numbers, which would allow China’s government to monitor its citizens’ queries. It’s also claimed that officials could use the search engine to provide false data on the country’s air pollution problem, something it’s been known to do in the past." Additional pressure from House lawmakers want answers from Google on censored Chinese search engine adds to the apprehension. "Since news broke last month that Google is working on a censored search engine for the Chinese market, the company has faced unrelenting criticism from lawmakers. In the latest demand, a bipartisan group of 16 House representatives is looking for answers on the still-secretive plan. “As policymakers, we have a responsibility to ensure that American companies are not perpetuating human rights abuses abroad, and to ensure that our regulatory and statutory systems are able to deal with changing business environments,” the letter reads. The lawmakers are requesting more details on the company’s plans. Among the questions for the company: what restrictions will it place on the search engine? And if Google left China in 2010, why has it decided to move back now?" While this inquiry is useful, a much more important trepidation needs to be confronted. The anti-American sentiments that Google has demonstrated is displayed openly for all to see. Many obsessed cyber addicts are consumed with the programming that comes from the Google version of reality. The sad saga which transformed a useful search engine into an indoctrination gatekeeper of censorship that conforms to a 'politically correct' distortion of veracity is appalling. Google has become an integral integration of the globalist model of mind control. No prudent or objective person can trust the selective search results or content that streams from using their resistive web sites. Dragonfly or whatever their next project that herds the public into solitary confinement is meant to eliminate any dissenting viewpoint that conflicts with the totalitarian elites that have always been behind shaping the Chinese dominion. "acknowledged the Chinese ability to harness the web’s power for its economic progress, but he also worries that with great Internet power comes great censorship. “I think you’re going to see fantastic leadership in products and services from China. There’s a real danger that along with those products and services comes a different leadership regime from government, with censorship, controls, etc.,” said Schmidt." Not exactly a ringing commendation of the Chinese regime. No surprise coming from the arch scoundrel who built the Google domain. Absent from most scrutiny on cyber tech are discussions about the abdication of moral standards by despotic governments. The creation of the Dragonfly filters reflects an unholy alliance between a "so called" commercial company and a communist oppressor. Red China is already at war with the United States. However, the apparatchik Maoists is waging economic sabotage on American business and steals our technology with impunity. Why allow Google to supply the coding to advance this betrayal? Prohibiting the transfer of technology originated from NSA research, funded by DARPA and advanced by the intelligence community is a national imperative. Those who regard Google as merely a stock opportunity are blind to the underlying function and purpose of the systems that employ their real objectives. Dragonfly is the latest warning to strip Google of its hideous intentions to rewrite current events and erase past history. By omitting and purging challenging accounts, the goal of maintaining the approved narrative becomes even more obvious. Prepare for the exodus of Google to their People's Republic of China Shangri-la. Many of their U.S. university computer trained graduates will eagerly follow. Without stern measures that prohibit this revolving door, America will continue to encourage its own demise by educating Chinese nationals. Still have doubts? Just examine the treachery, Dianne Feinstein’s Longtime Driver Was a Chinese Spy. Look at Google as a spy campus in training that steals high tech secrets for the benefit of Chinese oligarchs. Dragonfly may be the latest example of systemic tyranny but it surely will not be the last.